Right, finally, I'm onto blogging about movies I have actually watched this year. I don't know if you could count a short film as an actual film, but since I'm Here is so great, it gets some love on the blog. It came out a little while back, and luckily someone has uploaded it to youtube, so now everyone can see it. I seriously recommend this movie, and that's not just because it has Andrew Garfield in it. I'm Here is a love story set in a world where humans and robots coexist. We follow Sheldon (Andrew Garfield) and Francesca (Sienna Guillory), two robots who meet and fall in love. Sheldon works at a library, and is waiting for the bus where he sees Francesca driving her car. A human makes a comment of how robots shouldn't be allowed to drive cars to Sheldon. On another day, Francesca drives past his bus stop with a carload of passengers, and insists that Sheldon allow her to give him a ride home. It's here that they realize the full potential of their relationship. As their love grows, so do the problems that face the two robots. 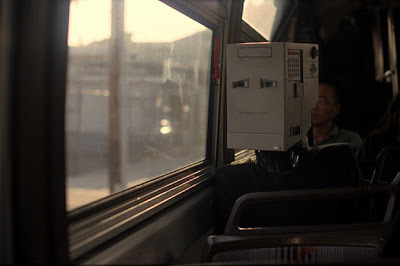 The first scene shows Sheldon on his bus ride home, which gives us a slightly scary look at the future and what would happen if robots and humans did coexist. We see robots doing all the things that humans can do, but there's a sublte loneliness to poor Sheldon. This is emphasized a little by when Sheldon goes to his apartment block and tries to talk to his neighbours. He's happy in his own little world, but, of course, the fact that he has no real connections with anyone makes him wanting a bit more out of his life. This is the kind of insight that a robot movie should have, especially when love is thrown into the equation. While having sci-fi elements, this film doesn't use high budget technology to convey it's simple message. Take a look at the design here. The robots are simple, as if they were put together using multiple parts of technology that are easily found. Ever wondered how robots recharge? Just as if you would charge a cellphone. But it's with this simplicity that the themes really shine. Throughout the course of the film, there is a storyline that could be easily applied to real life, just not in such drastic circumstances. At a rock concert, Francesca loses an arm, whereupon Sheldon donates his working arm to her, leaving him without one. Another time, Francesca loses her leg, which prompts Sheldon, against Francesca's wishes, to give his leg to her, leaving him without one. Later on in the film, Sheldon recieves a phone call that Francesca is in hospital, torn in two. Sheldon decides to give his body up to her, leaving him with just a functional head, which Francesca is seen cradling at the end of the film. It really begs the question, how far would one go for love, and, overall, how much would someone give just to be with someone? Spike Jonze directed this short which was fully funded by Absolut Vodka, as a promotion for the company. It was released at the Sundance Film Festival in January 2010, but it's main purpose was to be shown to audiences and then to get their opinion on love after seeing the film. In just under 30 minutes, I'm Here seems to sum up love in such a enigmatic way, but seems to capture it in such an atmospheric way that it is special. Everything about it is special. 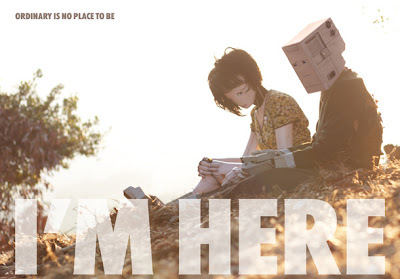 I'm Here is such a heart-breaking, beautiful tale that deserves to be watched by everyone. Glad that you got around to watching I'm Here. It is beautiful piece of art, and as you said - it should be watched by everyone! This film...man, just killed me. My favourite Andrew G role by a mile. Its so awesome, he was wonderful...even though he was a robot!